Although the main gameplay of Grelox has been decided, I'm currently standing at a fork in the road and have to make a choice. When Grelox was originally conceived (as Apothecary) the aim was to make it suitable for short development and also to fit in PC Engine rom space. Now, we have a little more freedom, there are choices to be made. The size of the game map is tied in to one of two styles. The first (original) style was a game where you played, learned the map, learned the puzzles, hit Game Over and started again. Each time you'd get a bit better, know where to go and what to do to progress. The Zillion model. The second style is where you have save points and progress just by getting a bit further each time you play, without having to repeat the puzzles or areas each time. The Metroid model. There's something to be said for each model. Zillion-style is more traditional and can mean a tighter, more challenging game with a smaller game map (as it has to be practical to complete the game in one session once you know what you're doing). Metroid-style means satisfaction by constant progression, more of an adventure feel but requires a much larger game map as you don't get the 'replay' value of a die-and-start-again Zillion style. Another aspect of the Metroid model is that it seems fairer to most skill levels, less repetitive and easier to balance. 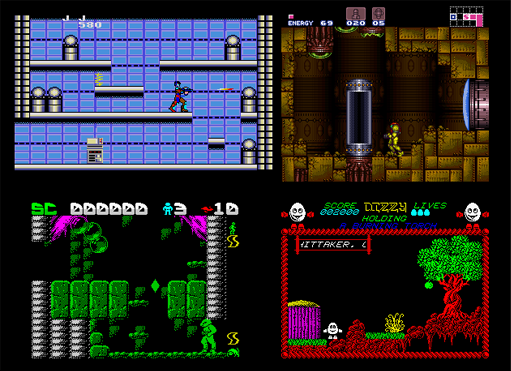 I'm currently considering doubling the game map (to over 200 screens) and choosing the save-driven Metroid style. What do you think? It's always a really hard decision to close the door on something that you've spent an awful lot of time with - any project you work on seeps into everything you do as in the back of your mind, you're always trying to plan game mechanics, plot details, how things will look or clever puzzles to include. It becomes part of your everyday routine, not to mention the evenings spent sitting in front of a monitor mapping or drawing tiles and sprites worthy of inclusion. After 2 years of planning, Apothecary for PC Engine is no more. Apothecary was the forerunner to what Grelox will become - an arcade adventure using item puzzles as a form of game progression. It was always simpler than Grelox, as I designed it with my mind firmly on making it as easy to program as possible without sacrificing too much gameplay (and so there was no attacking, only dodging, no bosses and no scrolling!). So why is it being put to sleep? It's all a case of timescales. 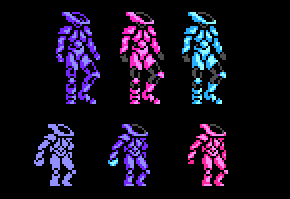 From inception, Atlantean (our almost-finished PC Engine project) will be coming in at about 3 years development time, and that's for a simple Defender style shooter. 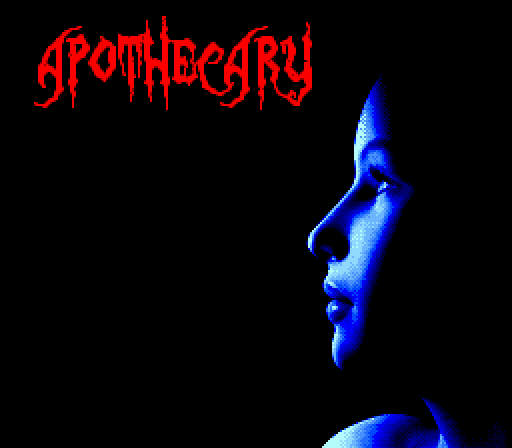 Apothecary has already been in development for 2 years, and that's without a single line of code being written. It was due to be started after completion of our 'Jungle Hunt' and 'Joust' projects, which means it probably wouldn't see the light of day for a long time. PC Engine development is fun and exciting, but it's also very, very hard and slow. With just 2 people working on a game as ambitious as this, it's just depressing to think about. That's why once day I realised that pursuing Apothecary any further was going to be more hassle than it's worth (i.e. I'd probably be dead from old age before it gets finished). While the plot, puzzles and other elements will be lost, at the very least I can salvage some of the map layouts and don't be surprised if a few of the background tiles turn up in Grelox, which promises to be a much faster development period due to the tools we have at our disposal. So here I present a collection of images for Apothecary, the PC Engine game that never was. Animation for our main character, Amirella. She's a bit nudey because the game was planned as a sister project to Inferno, which had a slightly nudey man in it. So where did the name Grelox come from? Well it has a long history. Back when I was at school (around 1988/9 perhaps) a group of friends and myself decided to make a fanzine reviewing video games (mostly imports). These were the days where you had to physically photocopy actual paper and staple it together to pass around information. Well I can't remember us ever finishing a single issue, or if it even got past the initial planning stage, but we did come up with a name: Grelox. It stood for Games Reviewed Every Lunar Occidental Xenith (which despite the fact we had to spell Zenith wrong, means every month. At least we thought it did, you might have to ask an astronomer to confirm). More recently, when Grelox began to be discussed, it was a combination of various games, mixing in another of our projects (called Apothecary). So for a while we were referring to it as 'Apothezilliontroid', 'Zillipothecaroid' 'Metrionecaryvania' as so on. This was beginning to get hard to type, so I decided to codename it Grelox as that just popped into my head. The name stuck. So Grelox has quite a long history as a name. I'm glad it's finally getting used for something.